The 2014 annual report describes the context of the mediation in the Engie Group and summarizes its activities, analysis and generic guidelines. 2014 was marked by many events which have contributed to demonstrate the intest of an independent mediation in companies: increased customer requirement, accelerated regulatory developments both in the field of energy and in the one of consumption, an increase in precarity, particularly energetic … in a context of great change in the energy sector as in the ENGIE Group. and promotional activity by external networks and stakeholders, particularly consumers associations. Secondly, customer experience have been optimized and reduced in certain entities in the Group (the biggest providers of claims), following the Mediator’s recommendation, to contact more quickly Mediation when customers are not satisfied. As in 2013, files were mostly treated winthin 2 months or less, for non-complex cases. 92% of the Médiator’s conclusions And were accepted by the applicants. Meanwhile, the number of overall requests continued to decline, to $ 4,301 requests in 2014 (a decrease of 10% compared to 2013). This development should be compared especially with the steady improvement of the relationship of Engie Group with its retail customers. In 2014, the Engie Group’s Mediator participated in promoting the alternative disputes resolution approach as a credible alternative to litigation, in all B2C entities of the Group, particularly in Europe. The increase of vulnerable people unable to pay their bill to their supplier, or requiring the application of social tariffs. people who want to reduce their energy bills by carrying out works, and waiting in fine coaching in the knowledge of their buildings and in the choice of renovation solutions. The Mediator proposed generic recommendations relating to the previous points, and also recommended strengthening the control of claims processing. 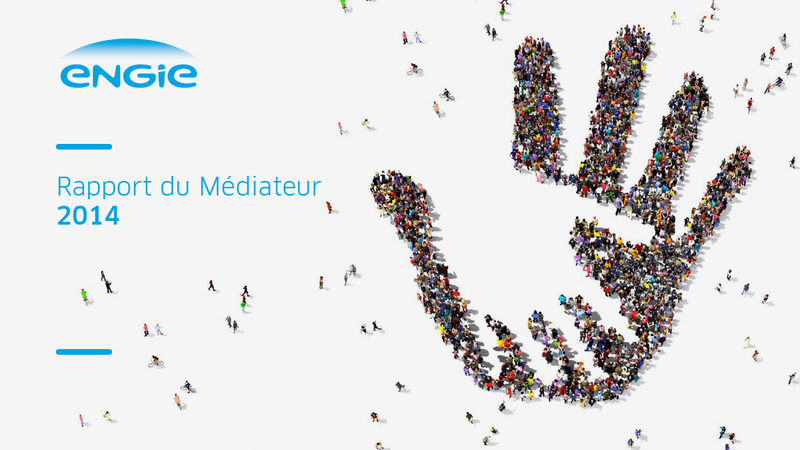 2014 was also that of the 15 years of the Engie Group’s Mediation: A demonstration was held in the presence of all former mediators of the Group, and this was an opportunity to demonstrate the value of a corporate mediation, both for customers and the Group stakeholders. Finally, the Mediation has been (and is) the center of much debate since the European Directive of 21 May 2013, imposing widespread mediation for consumers in all countries of the European Union . As the Directive, the future french legislation provides corporate mediation, with defined criteria of independence and impartiality.